If you’re heading out to Orlando this month to take in the annual Halloween Horror Nights and want to stay one step ahead of the crowds, VisualTravelTours has a guide for you. The largest supplier of guided tours for mobile devices, VisualTravelTours recently announced the first tour of Halloween Horror Nights as a QuietGuide (text + images). Originally designed as a three-night Halloween party for Orlando locals, Halloween Horror Nights has evolved into a 23-night event. Considered one of the top two Halloween events anywhere, Halloween Horror Nights is extremely intense and NOT recommended for children under the age of 13. There is graphic gore, violence and sexual innuendo. That said, the guide book tour is perfectly acceptable for any reader. If you’re a first-time visitor, prepared to be overwhelmed. The crowds, special effects, and sheer terror have that reputation. 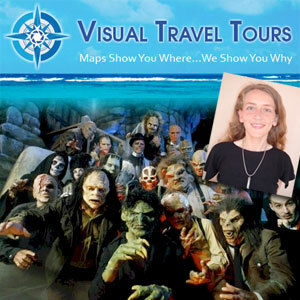 In the VisualTravelTours tour, a former scare actor takes you into the heart of the action. You’ll learn to navigate the event like a pro and along the way, you will go behind the scenes into the past, present and future of this unique party. The author, Lisa Fritscher, was raised in Central Florida and has published more than 1000 freelance articles. Before becoming a writer, Lisa was employed as an actor and attractions spieler at Universal Studios Orlando, Walt Disney World and Sea World Orlando. The QuietGuide can be played on any device that has a PDF reader. I was going through your blog and your blog posts are great especially the one on Halloween celebrations in Orlando. In fact, we have been blogging about Halloween 2010 celebrations for our client Hotel Worldquest Orlando too. It would be great if we can get this link on your blog. Let me know what you think and what the best way to have a presence on your blog is? Well, you can send me a press release … if it interests me and is a good fit for the blog, I’ll write it up. In the mean time, your comment gives you some back links.